jacq and will went up the hill: The Grand.... Traffic Jam? Imagine all those movies that you’ve seen that have road trips – not the gross-out comedy type, the meaningful driving-as-self-discovery montage type. Got it? All set to a soundtrack of thoughtful, romantic, just slightly edgy music. Discovering that driving anywhere always takes longer than it says on Google Maps. We have certainly had some unplanned adventures so far! 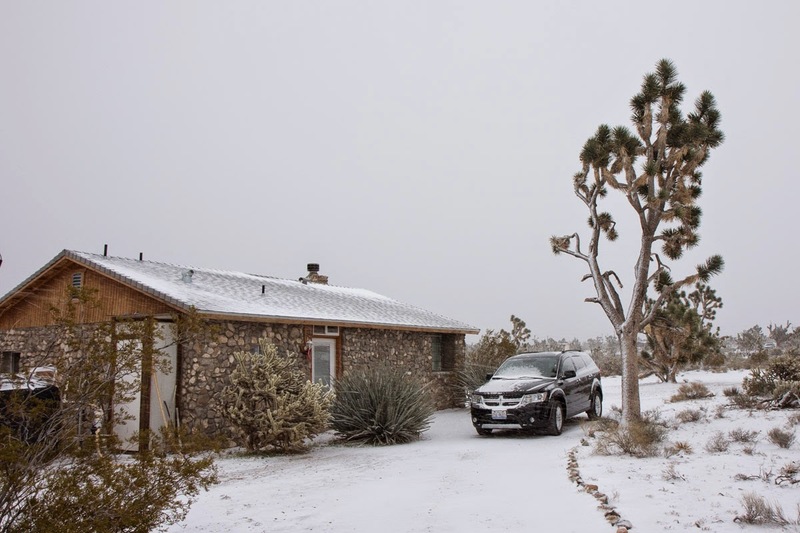 Despite the traffic, our first day’s driving from Los Angeles to a tiny dot of a town called Dolan Springs (where we stayed in a cute little stone cabin) was long but mostly uneventful. I even came up with some new road trip games - like saying passing signs in an overdone American accent - try it now - say 'San Bernadino, California'. Isn't that fun? The next day we woke to a smooth, glorious covering of snow. I think people who live in countries where snow happens with regularity get over being excited by 'the first snow of the season' but we are unaccustomed enough to skip around gleefully and take a ridiculous number of photos. If we'd known what havoc that snow was going to bring, perhaps our excitement would have been a little dampened. The day was frustrating to say the least – especially as we couldn’t get any access to the internet to find out what was happening or make bookings elsewhere. It would appear that snow in Arizona can even break the internet. 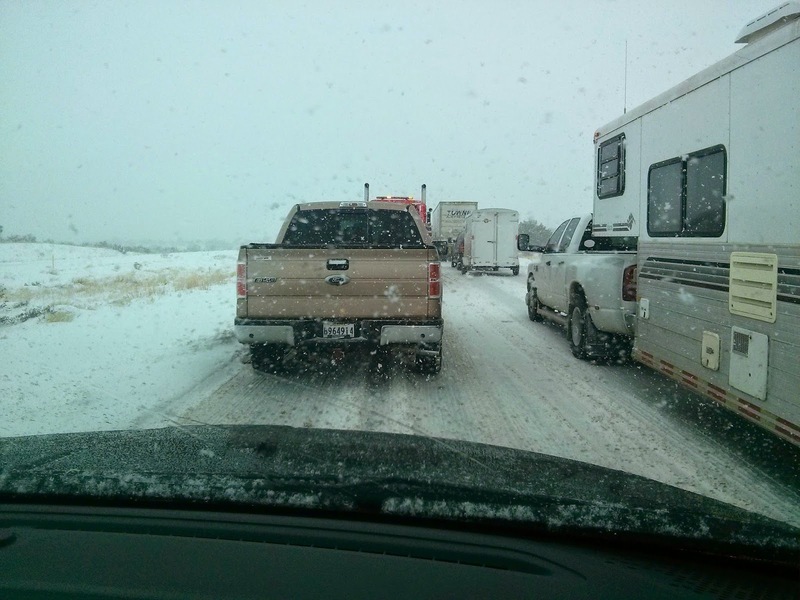 The atmosphere on the very closed I-40 was friendly and collegial. We stood around in the snow, arms crossed, legs stamping, sharing our thwarted plans. People offered us water in case we weren't prepared (being from Australia and all). Being the Australians, you would expect that it would be us skidding off the road into the snow covered banks but no, we leave that to the professional drivers. So. many. trucks. being. towed. And even after all that towing, they couldn't open the road. So we were diverted to a town called Wikieup (really), which had 5 motel rooms (in the whole town) and not surprisingly they were full. So like Mary and Joseph, we were turned away because there was no room at the inn. We ended up in a place called Wickenburg, which was described to us as a ‘cowboy town’ and that is exactly what it was. People wore cowboy hats without irony. For dinner we went to a restaurant that had BBQ baby back ribs and chicken fried steak as the specials. When a lady at the next table ordered tea she was asked “You wan’ regular tea or hot tea, honey?” There were cacti about three times as tall as me in the parking lot. Apparently (according to Wikipedia), Wickenburg started as a gold rush town and the buildings, particularly on the main street, are pretty much as they were originally built. We ended up there for the night instead of the Grand Canyon – a very quiet and uneventful New Year’s Eve but we were so exhausted we didn’t even care. We just hoped that the next day we would actually be able to get through all the closed roads and traffic incidents and get the itinerary back on track!